The first widespread rainfall of the season will move into southern Manitoba this weekend. Winnipeg will wrap up the work week with another seasonably cool, mostly cloudy day. A weak Arctic ridge moving through in the region today will keep temperatures down. The daytime high should be around +4°C, but it might get a couple degrees warmer if more cloud cover burns off a bit earlier than expected this afternoon. The city should see some clearing this evening, but more cloud will begin moving back in overnight. Temperatures will dip to a low near -4°C. Saturday will see a complicated system developing over the Northern Plains and eastern Prairies. A weak low pressure system will develop over central Alberta on Saturday while a stronger low develops over Nebraska. As the southern low strengthens, the Alberta system will weaken to a broad trough. A broad south-easterly flow will then develop from the warm sector of the southern low into the northern Prairies. For Winnipeg, this will result in cloudy skies on Saturday seasonal high near 7°C. Northeasterly winds will be in place much of the day at around 20 km/h. On Saturday night, the surface trough will push into southern Manitoba, bringing a broad area of rain into the region. 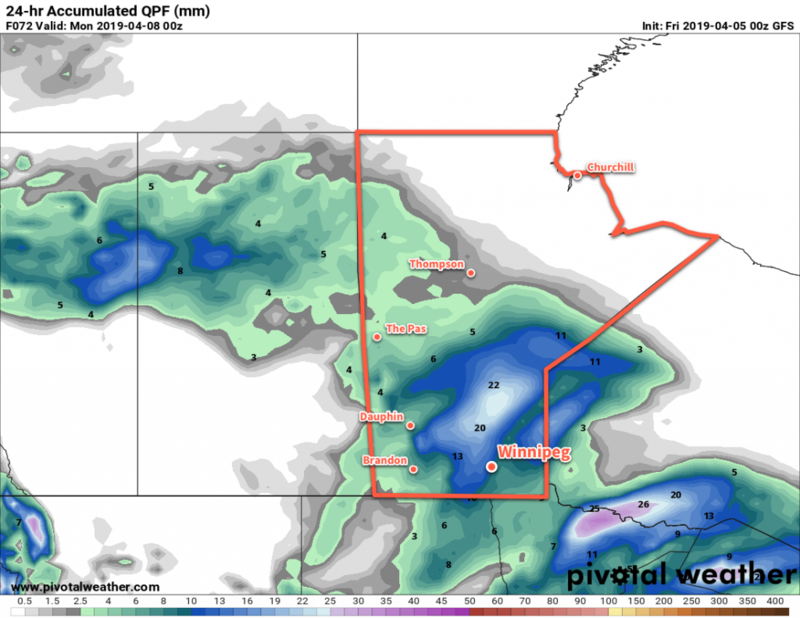 Winnipeg should see some rain begin overnight and persist into Sunday morning. Temperatures will dip to a low near +1°C with light winds. The Red River Valley is forecast to see over 10 mm of rain Saturday night into Sunday. Rain will taper off sometime midday Sunday in Winnipeg. The city is forecast to receive around 10 mm of rain which looks like a reasonable value right now. Once the rain ends, cloudy skies will stick around for the rest of the day. Temperatures will remain seasonal with a high around 6°C. The chance for some rain showers will return Sunday night into Monday morning as temperatures dip to a low near +1°C. The city will continue to see mixed to mostly cloudy skies of much of the coming week, but temperatures will remain near to above-seasonal. No significant precipitation is forecast through the week. Today’s seasonal daytime high in Winnipeg is 7°C while the seasonal overnight low is -4°C.